We’re approaching a bit of a dry spell in rock’s evolution. Not that there won’t be a few important releases and big hits coming up, and certainly there are a handful of major names that will be popping up on the immediate horizon, but in terms of momentum shifts in rock things will slow just a bit over the next few months of 1948 due to the circumstances of the times. We’ve already delved into the primary reasons for this – the recording ban that went into effect at the end of 1947 meant that what was being released through much of early 1948 was sort of stuck at the that moment in time. Just when rock, then only four months old, was getting its traction, finding its audience and starting to stretch its legs, suddenly they had to stop. Presumably by this point in late March of 1948 the best sides in the can from those last days of ’47 had seen release and it’d be awhile before anything more recently recorded got put out. So we’re left with a curious situation on our hands, a lull in the storm. It’s almost like when a pair of teenagers meet, hit it off and start spending time together, inching slowly towards a relationship in ways that are unique to inexperienced teens, when suddenly the boy’s family hauls him off on a two week vacation to visit relatives in some godforsaken remote outpost and maybe on the way check out a few desolate national parks just for kicks. The parents are thinking of it as an exciting experience for their son while the kid himself is thinking that two weeks away from the girl he wants to be with is the equivalent of spending twenty years on Riker’s Island. In his mind the potential relationship will never recover. So it was for rock ‘n’ roll. Just when they were poised to follow up the breakthroughs of the past six months with something that takes things even farther, whittling down the dated excesses, adding more of what was working to the formula, and polishing it to a high sheen, they find themselves stuck on the sidelines, instruments gathering dust as the clock inches forward. Now truthfully the artists were all still WORKING. They were playing clubs, dances and woodshedding amongst themselves after hours, trying to figure out what more they could do to elicit a bigger response on stage. The problem was records were still the way to reach the most people at one time to take those experimentations to the next level. What was going to mark the next national trend in this wild musical ride was probably something that hit all at once and to do that you needed new material coming out regularly on wax. Not just your own but other artists too, all collectively seeking the new wrinkle in this budding sound collage where one person’s innovation could be heard, dissected and taken further by someone else, all within a matter of days or a few weeks at the most. Instead many of the records that will have the biggest impact on the charts over the next few months were in fact ones that had already been released, in some cases as late as last fall, and those which had best anticipated the coming rock tide would be the ones that got belatedly rewarded for it when little in the way of newly released material would suffice the longer the draught on new material lasted. It’s no wonder this was the last widespread recording ban in music history. Time marches on and there’s no reprise for those who dutifully sat on the bench waiting for the signal to get back in the game. By then oftentimes it’d be too late. Thus we come to a record that serves as sort of a perfect placeholder on our journey. A thunderous piano boogie by a shadowy figure we haven’t met before and won’t meet again on a label that was yet to make its own mark but which would go on to be crucial in rock’s development with an ownership shift and name change to Chess Records. If ever there was a song ideally suited as intermission music in the first year of rock music it would be Tonky Boogie. Frantic, ebullient, played sharp as a knife and serving its purpose to remind one and all what they came here for in the first place – excitement. Not much is known of pianist Forrest Sykes. Purportedly he’d played briefly (though never recorded) with Lionel Hampton in 1946 and had quite an underground reputation among musicians. He was possibly gay, unquestionably flamboyant, would reportedly guzzle gin like it was water and according to one and all was absolutely hellacious on the keys. Apparently he was from Kansas City originally but somehow established his home base in Philadelphia in the mid-40’s (Billboard Magazine has quite a few brief mentions of him over the years playing clubs in and around Philly starting in September 1944). By 1947 it seems he took up residency in Chicago clubs which is how he came to the attention to Aristocrat for whom he cut this lone session in October 1947. There are no other musicians listed on the session files, the label simply states “with rhythm accompaniment”, but one listen to this storming track and you realize none would be needed. Sykes’ incendiary playing is more than enough to keep you riveted throughout. 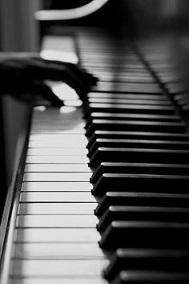 He hammers the keys as if he held a personal grudge against them and plays at such a breakneck pace that nurses must’ve had to be on hand in the studio to tend to him when he was finished. Though rock’s first decade was rife with piano pounders, arguably not until Jerry Lee Lewis came along nine years later would any match the sheer furious intensity of this one. But Sykes is in no-way ham-fisted (nor was Lewis of course), simply pounding out a generic boogie with no deftness of touch or technique, or someone guilty of substituting raw power for more intricate skill. No, not at all. His right hand is as nimble as they come, especially throughout the lead-in and what serves as the bridge when he lets up ever so much on the tempo, before racing back as if trying to outrun the devil himself. There’s really not much musical analysis that can be used here. Tonky Boogie is more a performance than a tightly constructed composition. It’s a show-off piece. The type of thing that goes over great in a club full of drunken patrons, either as an opening number to focus your attention on the bandstand, or after a series of more sedate numbers to give the hall a surge of electricity, or more likely as the closing number to get everybody feeling as drunk musically as they are physically after blowing their week’s paycheck on a night out on the town. Suffice it to say, when he played it in that setting you’d be on your feet as if propelled from a launching pad. As a record though… well, it’s hard to say. The excitement of it translates well but without the raucous crowd building to a fever pitch that propels all such showy exercises into the stratosphere it can’t help but lose a little of the exhilaration it attempts to convey. It’s a rousing performance, something you’re eternally grateful for someone having the forethought to capture on tape and make available to the public, but it’s probably not something that would be the number you’d immediately want to punch on the jukebox when there’s just five people in the café on a gloomy Tuesday afternoon out in the sticks somewhere. On a Friday night though you’d drive 40 miles out of your way to hear him play this in person amidst a boisterous crowd of fellow moral degenerates. Therein lies the difference. Rock in general, and this in particular, is music for the masses, the soundtrack to a bubbling social cauldron, and records, even the best of them, when taken out of that setting aren’t always going to have quite the same impact. What we’re doing here on Spontaneous Lunacy in fact is contrary to the way this music should be heard. This type of clinical analysis runs counter to the very purpose of the music where the only analysis that really matters is simply: Does it make you move and groove when you hear it? Twenty years down the road in the late 1960’s rock began to be dissected in print by literary types, fans of it though they may have been, and as such the communal nature of the music was downplayed by this new “rock press”, often to its detriment. Albums began to be pushed more than singles, their attributes better appreciated by individuals listening to them in solitary confinement, whereas in the era we’re still in the music was made for being heard and appreciated in crowded environs, and make no mistake about it those crowds were on their feet, not sitting in silence with rapt attention. The context of early rock ‘n’ roll was most definitely communal and its success was based on elevating the spirit of those assembled and getting them to dance, getting them to drink, getting them to screw, and quite possibly getting them arrested. Quite a difference in intent, wouldn’t you say? In the setting in which it was conceived, and for the audience it was intended in the era we’re immersed in now, Tonky Boogie succeeds far better than it would as merely a discographical study. This is a record where its context is everything. We need to somehow put ourselves in the mindset of those who enjoyed it IN that context even though staring at words on a screen is no substitute for staring at the shapely figure of whoever you’re grinding away with in some smoky hole in the wall club where this was being performed. But what the record does well enough for our purposes, perfectly actually, is to act as both a reminder of what it was about rock’s first half year that captivated us so much and to serve as a peek into the future, hopefully indicating that the music would continue to grow by exciting audiences who threw their fate in with rock ‘n’ roll, consequences be damned. In that context it’s damn good and ultimately that’s what matters most. As for Sykes himself, he’d keep playing clubs around the city of Chicago into the early 1950’s before fading into oblivion, dying young and leaving behind little other than a largely obscure record that crystallized a brief moment in time when the musical tectonic plates were shifting beneath society’s feet. The first rumbles of this earthquake had already hit and though there was now a brief pause it wouldn’t be long before the earth shook again. Seven decades later the aftershocks are still being felt. 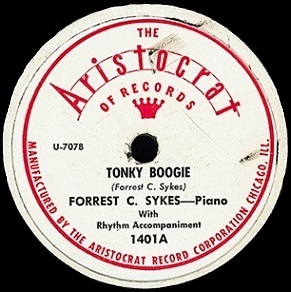 Leave a reply on "Forrest Sykes: “Tonky Boogie”"